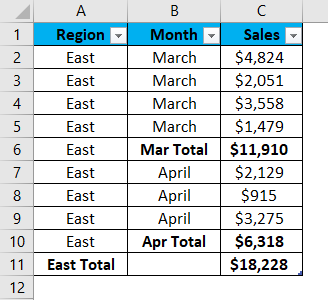 Group in Excel (Uses, Examples) | How To Create Excel Group? 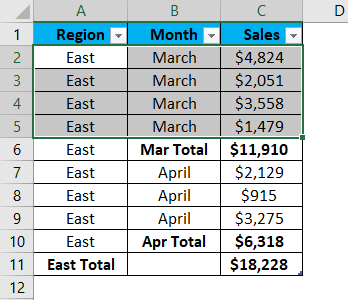 How to Create a Group in Excel? MS Excel allows the users to do grouping in excel, it is one of the best ways to manage the data. A user can use it to hide or show the data of their worksheet so that they can focus on the information they need in the worksheet. A lot of time we get a worksheet which has a lot of data, but we don’t need all of them. So here we can take help of Grouping- it makes our worksheet less cluttered, more organized and easier to view. Group: Press Shift + Alt + Right Arrow shortcut, rather than going on the data tab then clicking the group button and then selecting row or column option. Ungroup: Press Shift + Alt + Left Arrow shortcut, rather than going on the data tab then clicking the ungroup button and then selecting the row or column option. To create a group in excel is very simple and easy. Let’s understand how to create a group in excel with some examples. Step 1: Now, look at the below data in Excel Sheet which a user wants to be grouping. Step3: Now go to the Data menu bar. Click on Outline and then click on Group toolbar. Step 4: The pop- up Group will now show, in that select Rows (As the user wants to group by row). Step 5: Now click on the OK button. 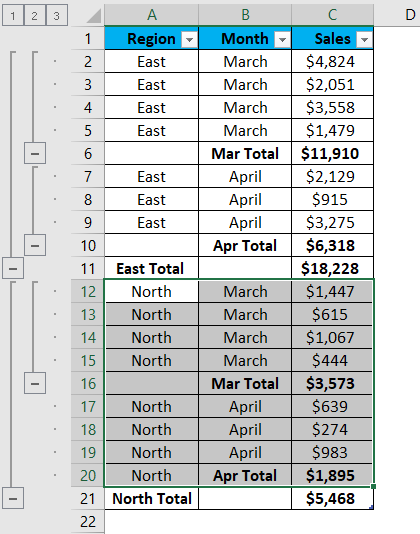 Summary of Example 1: As the user selects the row for the month of March, it is grouped into one. As well as two-level buttons are created on left of the worksheet, the highest level which is level 2 will show all the data while level 1 will hide the details of each size and leaving subtotal. Now the user can hide or show the group using the button that is attached to the bracket created on the left side. Click the minus sign to hide and plus sign to show it again. 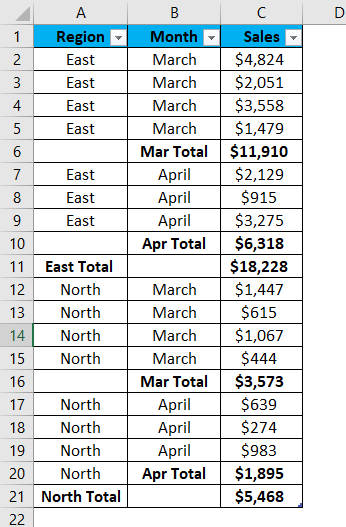 Step 1: Look at the below data in Excel Sheet which a user wants to group and select the row/column. 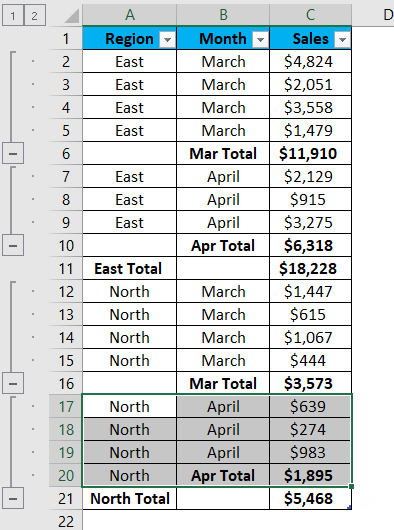 Step 2: As the user has selected row for the month of March and the region is East. Now go to the Data menu bar. Click on Outline and then click on Group toolbar. Step3: Now Group pop-up will appear select Rows and then click on Ok. The very first group will be created. 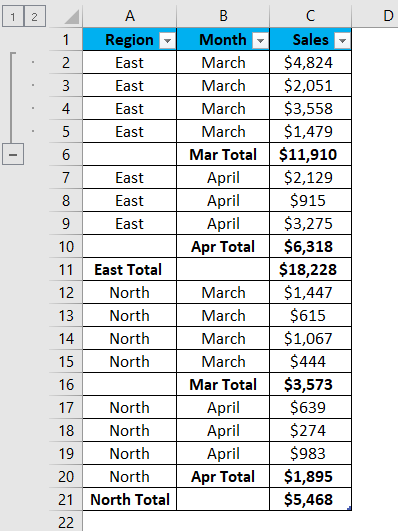 Step 4: Now select the April month data for the same region. Now go to the Data menu bar. Click on Outline and then click on Group. Step 5: Again Group pop-up will appear, select Rows and then click on Ok.
Now the second group will be created. Step 6: Similarly select the north region and create a group. Now the 3rd group will be created. In the same way, the 4th group is also created. Step 7: Now select the entire east region row and the 5th group will be created. Step 8: Now select the entire north region row and the 6th group will be created. Summary of Example 2: As the user selects a row for each month, it is grouped into one. As well as three level buttons are created on left of the worksheet, the highest level which is level 3 will show all of the data while level 2 will hide the details of each region and leaving subtotal and finally, the level one will grand total of each region. Now the user can hide or show the group using the button that attached to the bracket on the left side. Click the minus sign to hide and plus sign to show it again. Step 1: Go to Sheet Q1 in Excel Sheet where the user wants to group along with Q2 and Q3. Step3: Now release the Ctrl button and all three sheets will be grouped. Summary of Example 3: The Q1, Q2 and Q3 sheets selected by the user will be grouped. Now a user can perform an edit on multiple sheets at the same time. 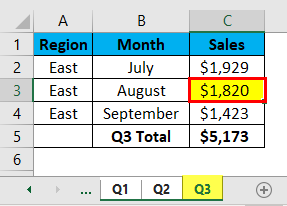 Let’s take an example where a user wants to update the data for August in the East region from Q3 sheets to $1820. Go to the other sheet this value will be updated in each sheet. 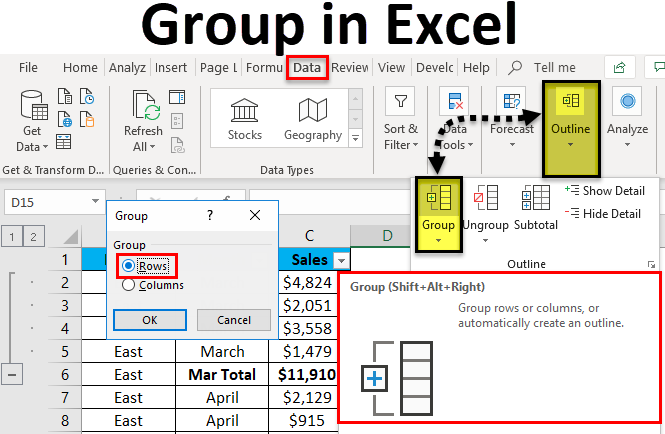 We used to get a worksheet with a lot of complex and detailed information and it is very hard to understand something in a quick way, so the best way to organize or simplify our worksheet is using Group in excel. The user needs to make sure whenever they are going to use group there should be column header, a summary row or subtotal if it is not there then we can create it with the help of subtotal button which is available in the same toolbar of group button. In Excel, a user should never hide cells because it will not be clear to the other users that cells are hidden so it can be unnoticed. So, the best way is to use group here rather than hiding cells. 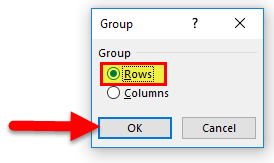 If the user wants to ungroup then select the row or column and then go to the Data menu bar and click on the Ungroup button. 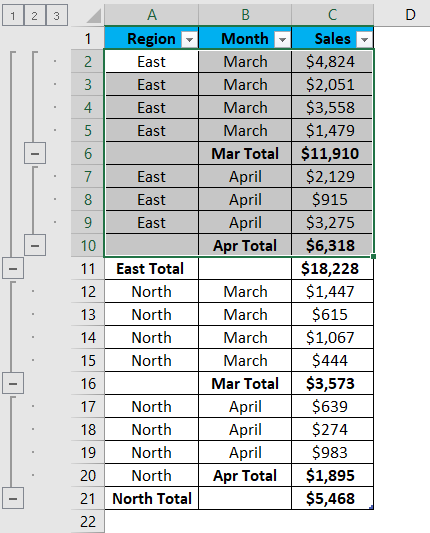 Always make sure whichever column a user wants to make a group has some label in the first row itself and there should be no blank row or column in excel. While creating group make sure all data are visible just to avoid incorrect grouping. Removing the group will not delete any data in excel. Once the user ungroups or groups he can reverse by Undo button (Ctr+Z). 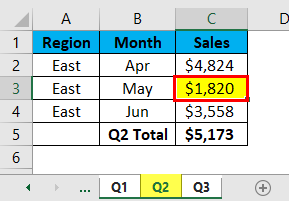 It is not possible to ungroup other adjacent groups of columns /rows at the same time; the user needs to do it separately. 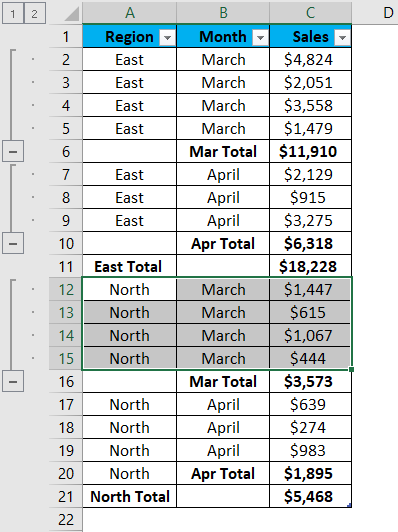 What is Wrap Text in MS Excel?